The MUSE Awards will again celebrate artistic inspiration on Friday, February 8, 2019 at 7 p.m. at the Museum of Fine Arts. The Arts Alliance’s sixth annual fundraising benefit for the arts will recognize the breadth and beauty of art and culture in our City of the Arts, and pay tribute to those that continue to inspire and guide St. Petersburg to its standing as an international arts destination. Proceeds will benefit artists, arts businesses, and arts & cultural organizations through our Arts Alliance programs and services. This year SPAA is proud to announce our Visual Arts Recipient is Mark Aeling. Mark earned his Master of Fine Arts in Sculpture at Washington University in 1993 and opened MGA Sculpture Studio, LLC, where he became well-known for the design, fabrication and architectural industries in the mid-west region. Mark relocated to St. Petersburg in 2005, where here he has completed commissions for clients including BayCare Health Services, The Florida Aquarium, and the City of St. Petersburg. In 2013 MGA was awarded a private commission creating six life-sized bronze dolphins for Sundial, a shopping and movie complex in the heart of downtown. This past summer Mark was awarded public art commissions for both the interior and exterior of the new St. Petersburg Police Headquarters. This fall he was asked to create a monument that commemorates the events of 9/11 called ‘Rise’ that will be located at the ArtsXchange in the Warehouse Arts District. Mark’s sculpture is inspired by object and focuses on the deeper conceptualization of form. He works in a variety of materials and uses many techniques for his creative process. Much of his work is representational but he would consider his focus to be on process. Aeling is often as inspired by how something is made as what he is making. 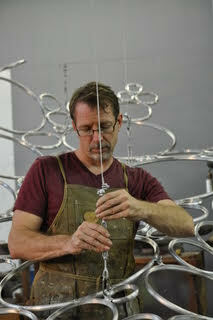 He has spent many years studying the subtle nuances of form and texture and how they are translated through materials. The fine-tuning of this process is a life-long pursuit. Tickets are now on sale on the SPAA website for MUSE sponsorships and individual tickets.